Taxi Airport Boeken specializes in airport transport. Both business travelers and holidaymakers can book a taxi or taxi bus quickly, safely and cheaply at Taxi Airport. We apply special rates for transport to and from Schiphol. You travel in a comfortable and economical way. You will be picked up by our driver at the departure hall 3a. 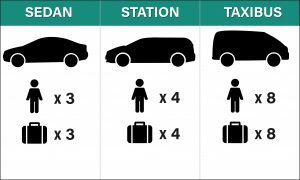 We advise to schedule a station wagon with more than 3 people, this in connection with the multiple baggage. For 5 to 8 people it is desirable to reserve a taxi bus. This way you can be sure that all your luggage can actually come along. Is there a small child? You can bring your own child seat. Please indicate this when booking. It is possible to take a baby on your lap, this is legally permitted. Rules for public transport are also valid for taxis. However, we recommend a child seat.